Taxing questions ranging from Tax Collectors Patron Saints to Aliens. 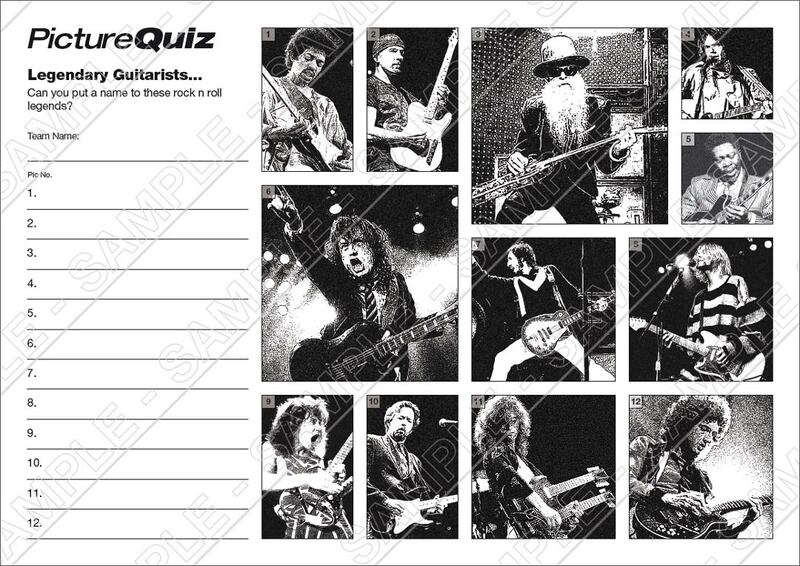 The Picture Round is Legendary Guitarists and the Wild Card is on the 80’s novelty act Black Lace. Q03. Which Scottish city has the nickname The Granite City? Q14. Which singer fronted The Commodores for 14 years before turning solo in 1982? Q26. Which European city hosted the 2006 Winter Olympics? Q38. Life’s a Party. Crash It. Is the tag line to which 2005 movie starring Owen Wilson and Vince Vaughn? Here’s a low-res sample of the Legendary Guitarists Picture Round, click for a higher resolution version. The Picture Round download is a two page high quality PDF with the answers on page 2. The Wild Card for Quiz 011 is a pop teaser about that horrendous 80’s novelty band Black Lace.